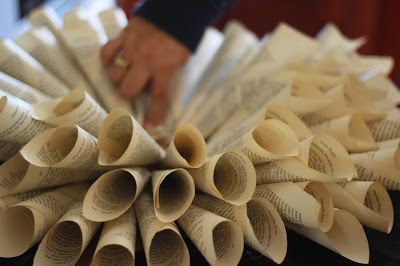 Last year I had watched this Youtube video on how to make a book page wreath..It was too close to Christmas , so I knew I wanted to make one this year . Yesterday my daughter and I made 4 wreaths and the tree topper ! Love the tree topper ! There is a special way to roll the book pages so watch the video , it really helps! 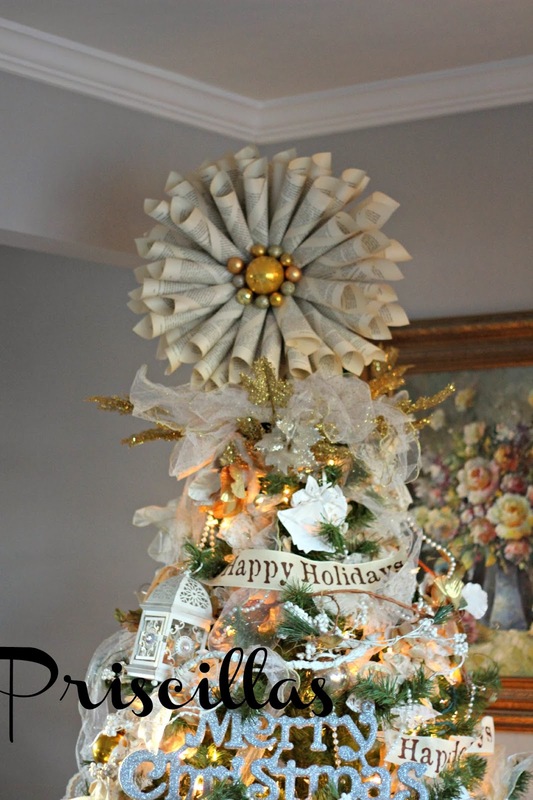 To make the tree topper I used a luncheon size paper plate turned upside down . Did 2 rows around the plate , added some ornaments for the center . We cut a piece of the roll from a roll of decomesh , glued it to the front of the plate and slipped the top of the tree into it .. Easy ! 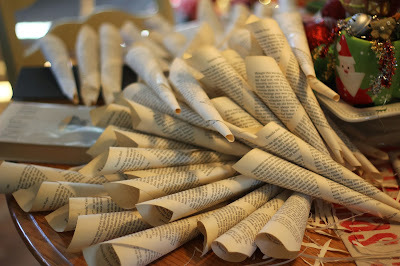 It takes about 120 tubes for each wreath, that you have to tape and staple..then glue. 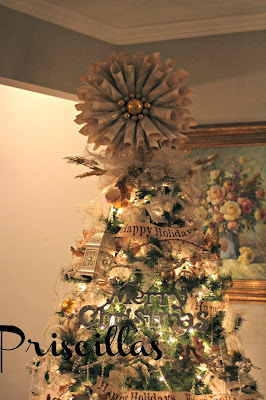 This tree is in the living room , its one of 3 in there right now.. hopefully adding the real tree today or tomorrow ! 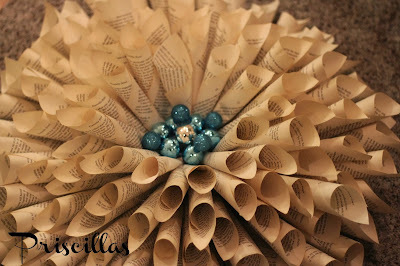 This wreath with the aqua is my daughters.. This wreath with the green and red is for my daughter in law.. The balls for the center of the wreaths came from Dollar Tree and Targets dollar section.or the tree topper I used some old ornaments to make it look more vintage. 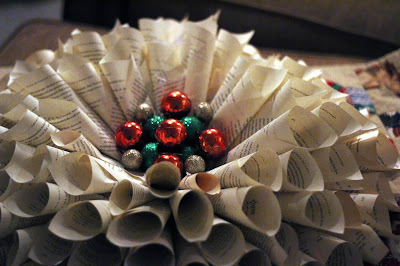 and this wreath is mine .. I hung it on the door in the family room that leads to the garage..from a piece of burlap. Aren't they all just beautiful ? Thanks so much for stopping by !I would love for you to follow me on Instagram, Facebook and Pinterest ..all the links are in the sidebar ! I have always wanted to make one of those gorgeous wreaths…it looks fantastic as your tree topper!!! Looks really great. You have a very telented hand to do all these pretty things. 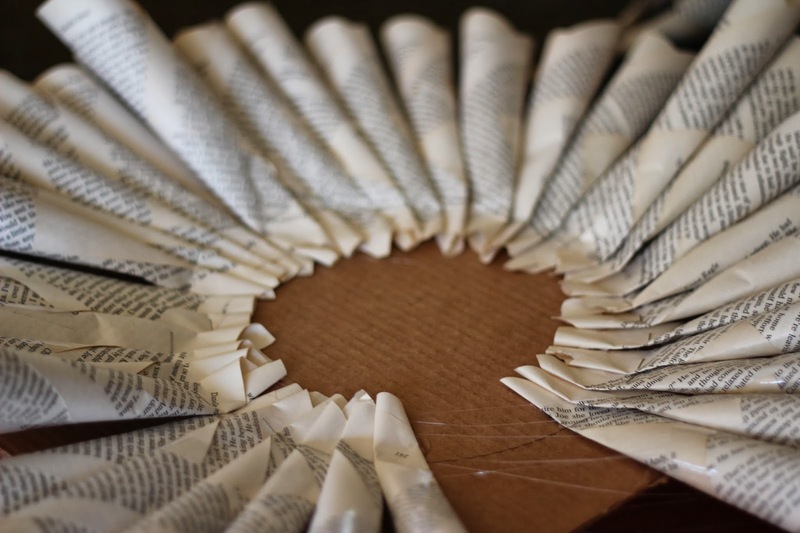 I love all these book paper projects but don't know if I have the patience. Love it! I'm just loving these. I especially love what you used in the centers. They do look vintage. This is the most unique Christmas decoration I have seen yet....I LOVE it!! I am so tired of my tree topper that I never really liked! 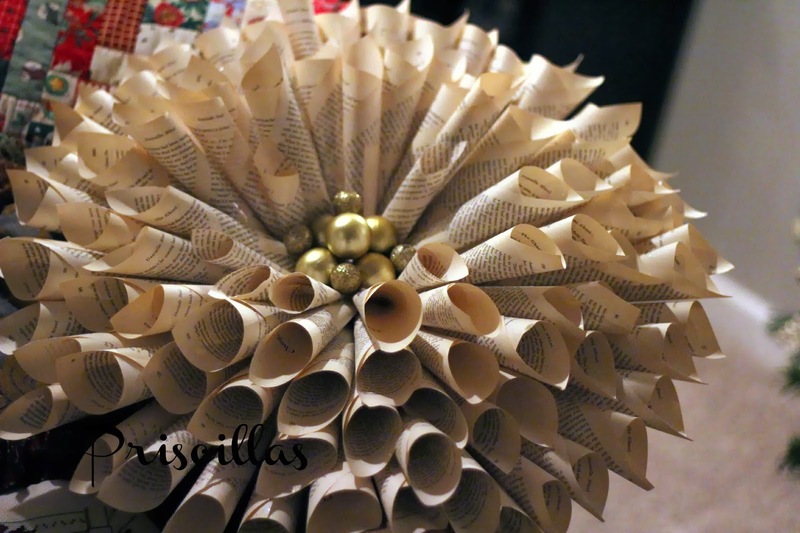 I will be making this one this year! Thank you for sharing. 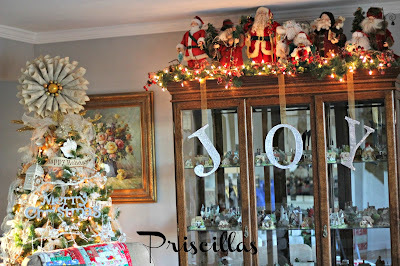 Visiting from Make it Pretty Monday and following you Pinterest! Those wreaths are wonderful.. they look like something you could buy at Pottery Barn or somewhere like that. Your tree topper is very beautiful! Thank you for sharing :) Visiting from The Dedicated House (Make It Pretty Monday)! The tree topper and all of the wreaths are just lovely. I have been wanting to make one of these myself but haven't gotten around to it. 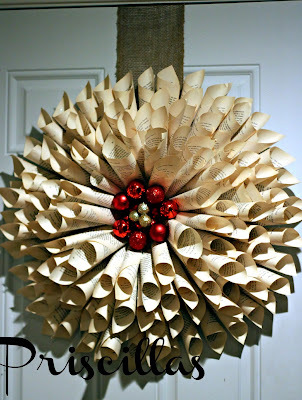 LOVE these wreaths!! This is something I am going to have to try my hand at for next year!!! Oh, I think this one is my favorite! 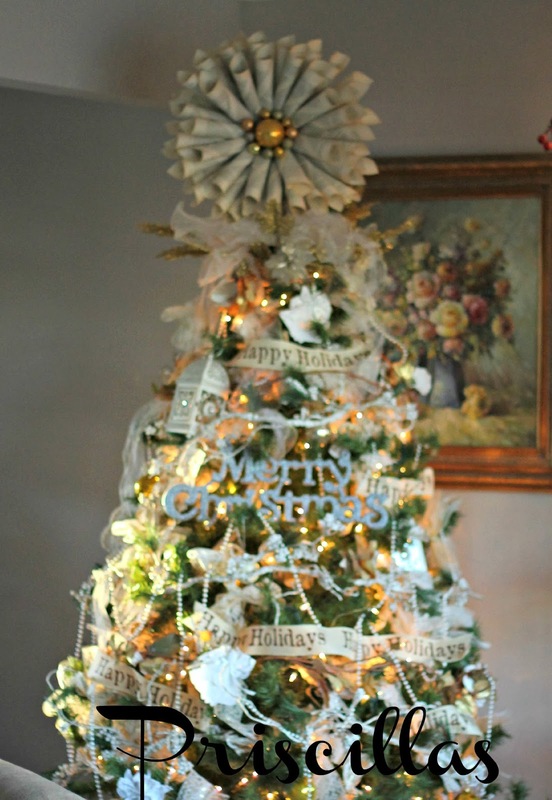 I love that tree topper! 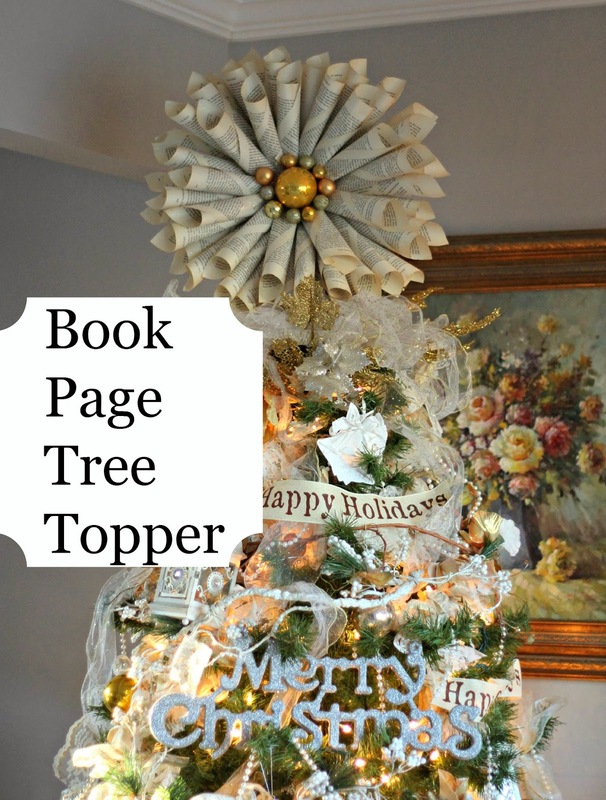 Thanks for stopping by my blog, so glad to have found all your beautiful trees! Have a great day! I love it Priscilla! 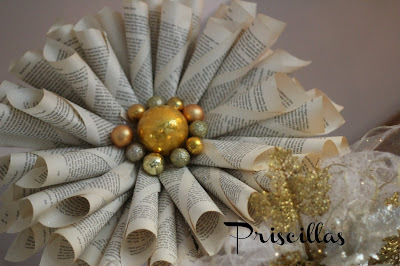 I have made 4 of these wreaths, but never thought of using one for a tree topper. I might see how mine looks on top of my mercury glass tree. Thanks for the idea! And thanks for sharing it with SYC. That looks amazing and elegant at the top of the tree. Love it! Oh my goodness, you really go all out for Christmas. I thought I did. 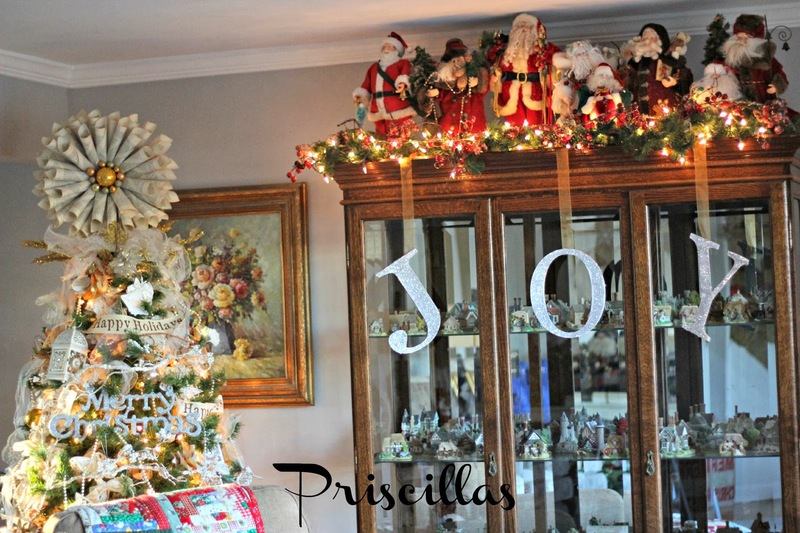 I love, love, love those wreaths and tree topper. I can see myself making some this summer when I am off from work and giving them next year. Your house always looks so amazing. I love the book page wreath - that is the perfect topping for your tree. I want to know where you get all of your energy, especially in your cross stitching. Love looking at your blog. Have a very Merry Chritmas.